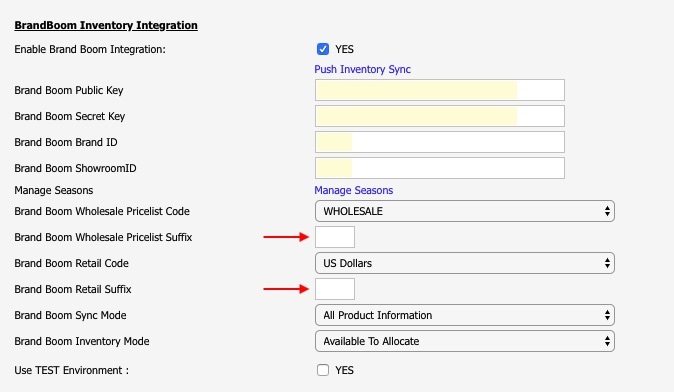 When syncing Product information, use the Brand Boom Wholesale and Retail Code dropdowns to select the appropriate Pricelists you've set up in Blast Ramp. The Suffix fields correspond to the suffix codes that you've set up for your Price Lists in Brandboom. If you haven't set up suffix codes, leave these blank. Otherwise, enter the values here. For example, if your Brandboom Price List is "USD 2," select the right list from the Code dropdown and in the Suffix field, enter "2".